There is a timeless sound in the rustling of pines on a breezy rise overlooking fields of mares and foals that stretch to a horizon also dotted by olive trees and the bobbing heads of sunflowers. Here, on tranquil sloping land outside of the ancient city of Bursa, Turkey, Ottoman emperors raised fine sporting horses as long ago as the 14th century. And it is here that American classic winners Victory Gallop and Sea Hero are helping to shape Turkey’s growing racing and breeding industry. Those who express concern about the welfare of American expatriate runners can release their fears about the stallions who stand under the auspices of the Jockey Club of Turkey, at either the Karacabey Stud near Bursa or the Izmit Stud near Izmit. 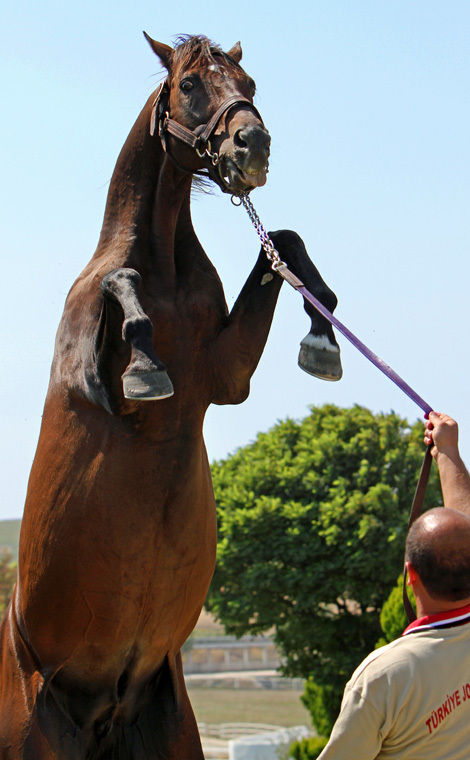 Victory Gallop strutted out of his Karacabey barn gleaming with dapples in late July, seemingly eager to show off to a crowd of about 60 Asian Racing Conference delegates who had taken a ferry from Istanbul across the Sea of Marmara’s blue waters before journeying on by bus to visit the stud. In his fourth year in Turkey, the 1998 Belmont Stakes (gr. I) winner who denied Real Quiet the Triple Crown had recently completed the breeding season in which he was allotted 120 mares. Shortly thereafter, Sea Hero strode past the crowd looking amazingly fit, defying the fact that he is the oldest living Kentucky Derby (gr. I) winner at age 22. Ever playful as he always has been, he danced and shook his head, daring his handler to keep him from displaying some airs above the ground. He was followed by former Overbrook Farm colorbearer Mountain Cat, who in 1992 established a mark as the all-time leading American juvenile earner when he won over $1 million. The son of Storm Cat has long been a Jockey Club of Turkey headliner because he is a leading sire and also because he dramatically rears on cue, and he delighted the crowd with a series of towering reaches for the sky. Champion Dehere and gr. I winner Cuvee also paraded for the Asian Racing Conference delegates, joined by American-bred but European-raced sires Sri Pekan and Royal Abjar. Victory Gallop is one of Turkey’s rising stars. Acquired in January 2008, his oldest Turkish-bred offspring are three, yet he already ranks among the top 20 sires. Both his book of mares and his fee of 10,000 Turkish lira (about $5,500) are the co-highest this year for the Jockey Club of Turkey’s roster of 22 stallions. Also standing for that fee are American-bred and –raced Lion Heart and Unaccounted For, who are based at Izmit. Lion Heart, the 2004 Haskell Invitational Handicap (gr. I) winner and Kentucky Derby runner-up who also was allotted 120 mares while in his third season in Turkey, has been the subject of offers from American farms who want to return him to the United States for stud duty, Turkish officials said. Whitney Handicap (gr. I) and Jim Dandy Stakes (gr. 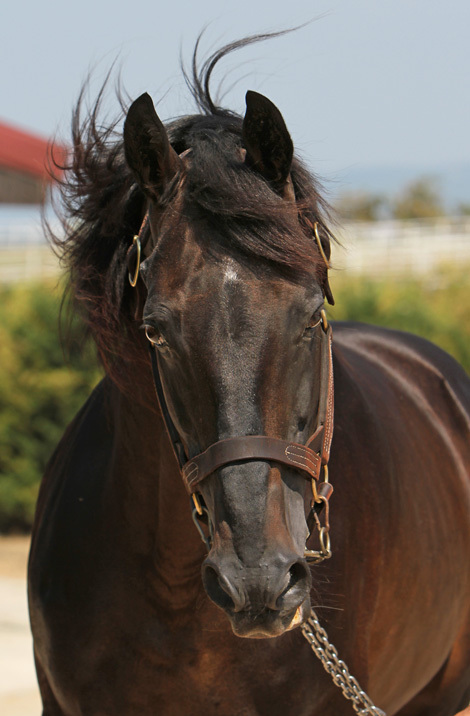 II) winner Unaccounted For, a 21-year-old son of Private Account who led all Turkish sires in 2009 and ’10 while battling some health ailments, was allowed 60 mares. Other leaders by mares in their books include 2000 Hopeful Stakes (gr. I) winner Yonaguska (120 mares), a son of Cherokee Run; American-bred Okawango, a son of Kingmambo who was French champion juvenile in 2000 (120); Carson City’s son Cuvee (100), winner of the 2003 Futurity Stakes (gr. I); Mountain Cat (100), and Arlington Million Stakes (gr. I) winner Powerscourt (80), a son of Sadler’s Wells produced by the Rainbow Quest mare Rainbow Lake, now famous as the second dam of the undefeated Frankel. 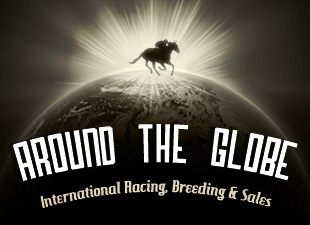 Overseen by the government’s Ministry of Agriculture, Food and Livestock, which receives a large slice of revenues from pari-mutuel betting on racing, the Jockey Club of Turkey soon will be seeking some new stallions, and officials indicated they will be shopping again in the U.S. Part of the organization’s mission is to encourage breeding and thus the stallions acquired with the ministry’s approval and financial investment stand for very reasonable fees. 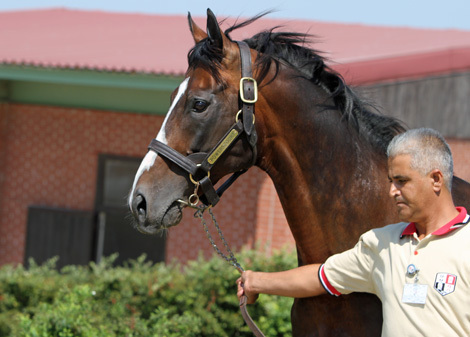 Sea Hero, for instance, the seventh all-time leading sire in Turkey by progeny earnings, stood for 3,500 Turkish lira (about $1,925) this year. Love and respect for horses and horse sports is ingrained in the Turkish people. During the Karacabey visit, Asian Racing Conference delegates were treated to a demonstration of the Turkish equestrian game cirit, also called jereed, that was developed at least ten centuries ago and used by the Ottomans to hone the cavalry’s attack and defense skills. 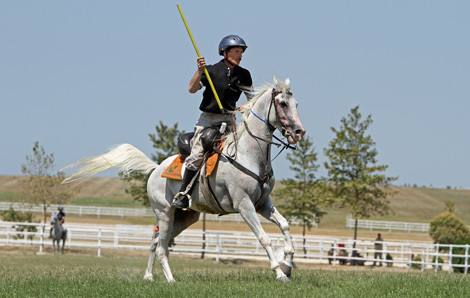 Players, who at Karacabey were riding retired purebred Arabian racehorses, try to hit one another with wooden javelins while relying on their horses’ speed and agility to escape retaliation. Hitting a horse with one of the javelins, which are rubber-tipped to prevent injury, is penalized. The game of cirit also known as jereed. Mustafa Kemal Ataturk, the skilled horseman and military leader who founded the Turkish Republic in 1923, declared that “Horse racing is a social need for modern society,” partly to encourage his cavalry officers to continue their work with horses. That quote remains the mantra of the Jockey Club of Turkey to this day. But the Turkish attachment to horses obviously goes back much farther in time. Thousands of years ago, Turkic people on the Central Asian steppes were the first in the world to domesticate horses, and their power on horseback dominated history for centuries. That deep connection still is revered. In the stallion barn at the purebred Arabian breeding complex near the Karacabey Stud hangs a sign that quotes scholar Kashgarli Mahmut, who in the 11th century wrote a book containing the first dictionary of Turkic languages and the first map of Turkic populations. “Horses are the wings of the Turkish people,” the sign reads.